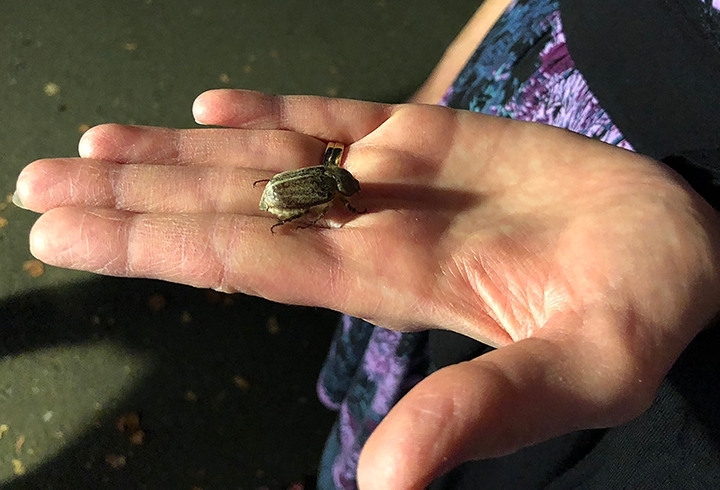 It was "Moth Night" at the Bohart Museum of Entomology last Saturday night, but three scarab beetles beat the moths to the blacklighting display. The UC Davis event took place from 8 to 11 p.m. Saturday, July 21 in celebration of National Moth Week, July 21-29, which celebrated the beauty, life cycles and habitats of moths. 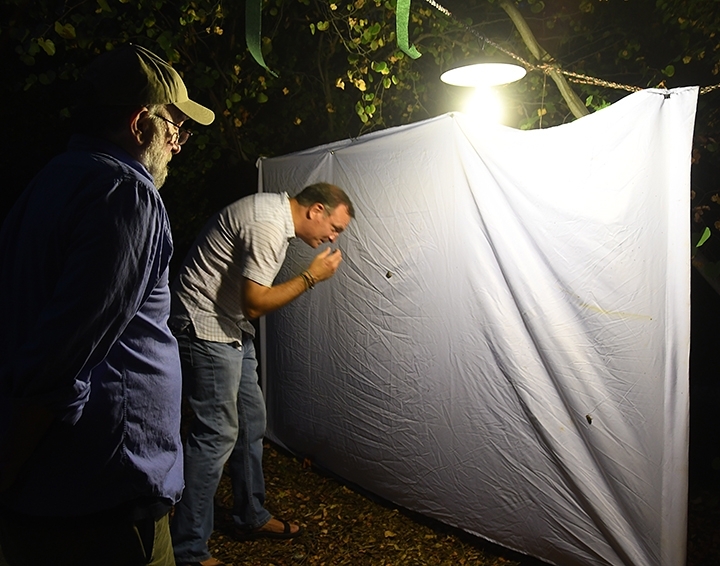 Entomologists use the blacklight to collect or view night-flying insects attracted to ultraviolet light. 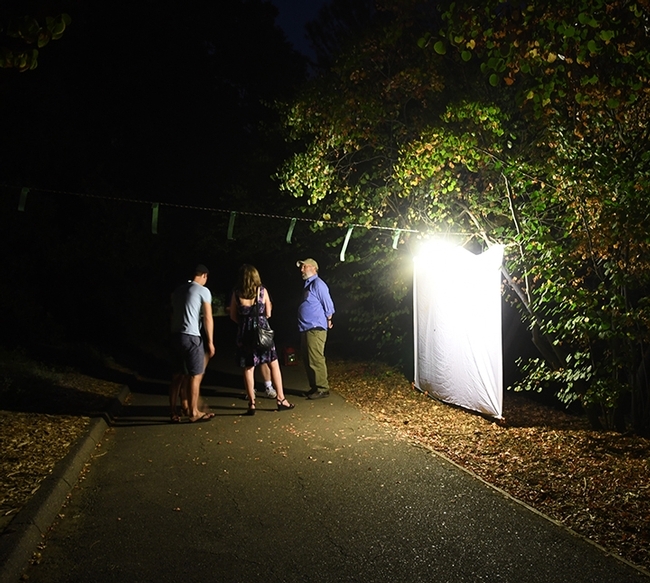 The Bohart associates set up two displays near the Bohart, but the one set up along a UC Davis Arboretum path drew the most moths--and the most spectators. Blacklighting is basically comprised of a hanging white sheet, illuminated by ultraviolet (UV) light and powered by a generator. More than 140 spectators attended Moth Night, held both inside the museum (located in Room 1124 of the Academic Surge Building on Crocker Lane) and outside on the campus grounds. 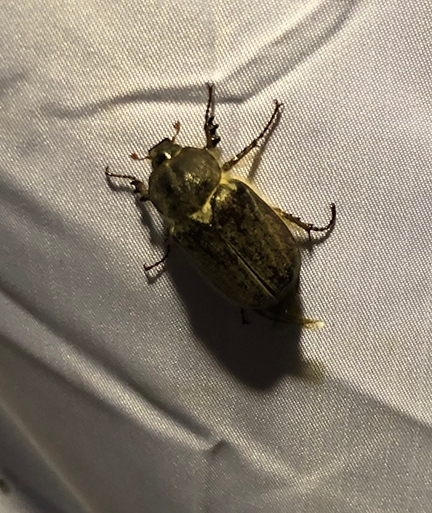 The scarab beetles or what some folks often call by the common name "June bugs" (referring to certain species of scarabs) showed up first, followed by assorted moths. Beetle expert Fran Keller, assistant professor at Folsom Lake College who received her doctorate in entomology from UC Davis, identified it as a Polyphylla sp. or lined June beetle. "I think it was a female because the antennae were reduced." De Benedictis said a young girl collected the Prochoerodes truxaliata, a moth that feeds on coyote bush as a caterpillar. The Bohart Museum, directed by Lynn Kimsey, professor of entomology at UC Davis, houses a global collection of nearly eight million specimens. It is also the home of the seventh largest insect collection in North America, and the California Insect Survey, a storehouse of the insect biodiversity. Noted entomologist Richard M. Bohart (1913-2007) founded the museum. It maintains a live "petting zoo," featuring Madagascar hissing cockroaches, walking sticks, tarantulas, and praying mantids. The museum's gift shop, open year around, includes T-shirts, sweatshirts, books, jewelry, posters, insect-collecting equipment and insect-themed candy. Pretty pitiful moth turnout. Forty years ago there would have been perhaps 50-60 species this time of year, including large sphingids (like the tomato worms, which are essentially extinct here). Numbers and diversity on the Sierran west slope are down, too.